A quaint little station of India, nestled in the heart of Nilgiris, surrounded by lush greenery and architecture right out of the British era – this is how one aptly describes the Wellington Railway Station. It is a tiny station that reminds you of the old world charm. Usually quiet and draped in nonentity the station fails to attract much attention. But all that changes as the train whistle is heard coming closer and closer. The gentle rumbling sound of the train is an omen for the station to leave behind its lethargy and come to life. The excitement in one and all present at the station, be it old or young is equally eminent and contagious. The Blue colored toy train graces the Wellington Railway Station with just one minute of stoppage. But the entire staff on board is extremely helpful and will get you seated before the train moves forth. The train itself is a reminder of the fact that journey in hills is best enjoyed through wide eyes and open windows. As the train chugs onward from the Wellington Railway Station, a little cheer goes up from the crowd as the true journey into the Nilgiris actually begins now. Between Wellington and Ooty the train stops at Aravankadu, Ketti and Lovedale respectively. The spread of nature that is presented before eyes is breathtaking and awe inspiring. Small hamlets, green tea gardens, tall trees and dense foliage presents an interesting collage of different shades of green with a splatter of colors thrown here and there. The rolling landscape is not only pleasing to the eye but refreshes the soul as well with its abundance of beauty. At every curve and bend, the entire length of the train can be seen easily. This makes for many little heads popping out of the windows. Before reaching Ooty the train passes through two tunnels. The sudden darkness encountered is evaded by the twinkling yellow lights in the interior of the toy train. For kids especially, this aspect of the journey is most beguiling. The slow climb uphill is hardly felt barring the dropping temperatures. When the journey is exciting, adventure is bound to happen. Our adventure commenced at the Wellington Railway Station itself where we (me, my mother-in-law, my friend and our four kids) came to know that the train was coming full and we might not get tickets. The children were upset and disheartened to hear that. But thankfully, our guardian angels were doing over time and hence saved the day for us. To top it all, the children managed to find window seats where there were none available. 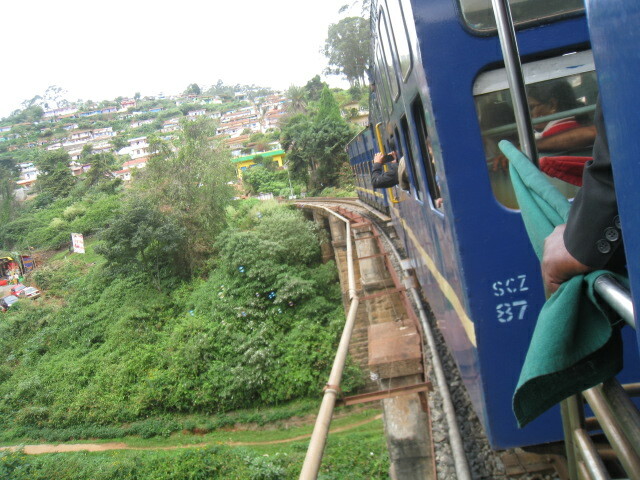 The moment we reached Ooty, we saw a never ending line of people already waiting to board the train. Alas by now our angels were also tired and decided to call it a day. The next order of business was to find transport back to Wellington. Stepping out of the Ooty Railway Station we saw the bus stop just across the road. Armed with the knowledge of English we identified a nearly empty bus leaving for Coonoor. Our ride back in the local state transport bus was much quicker. At Coonoor we hailed an auto rickshaw to take us till Wellington. Once there we retrieved our parked car and went home with lighter bags ( since the children had managed to make extensive headway into the stash of snacks) and tired children. Our joy ride in the toy train had become a lesson for our kids in the different kinds of transport on wheels. We started from the train and moved to a bus, an auto rickshaw and finally a car. 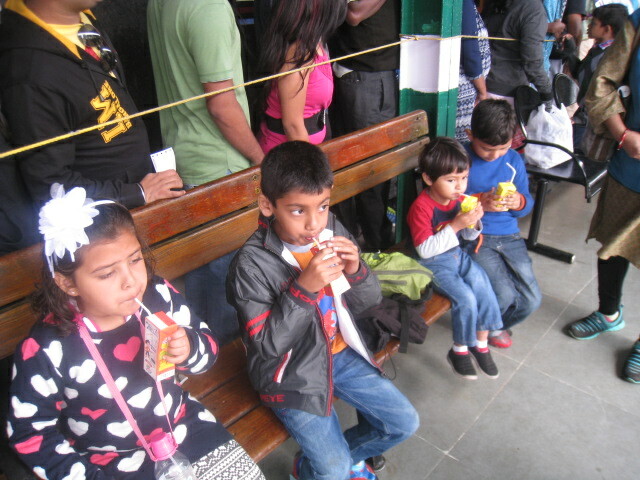 But come what may, the excitement in children for the toy train remains unfazed. They want to go travel in it one more time (although not necessarily the last one). Through their never ending enthusiasm and eagerness, we too shall live our childhood once again. I want to grow up once again. Always a pleasure when somebody enjoys your hard work. A railway trip in India must be a very special experience. I really enjoyed reading your article. Thank you!